The astrophotography group project nightflight captured this image of the star Canopus (known as the fictional home of the "Dune" planet Arrakis) over La Palma, Canary Islands, on May 3, 2016. The organization released the image on Feb. 5, 2017. The desert planet Arrakis is imaginary — from the famous science fiction series "Dune" — but the star it's said to orbit is real: Canopus, the second brightest star as seen from Earth. 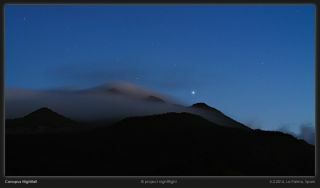 Here, Canopus shines above a volcano range on La Palma, Canary Islands. An effort called project nightflight, led by astrophotographers Karoline Mrazek and Erwin Matys, captured the photo on May 3, 2016. The photographers used image stacking and a diffusor filter to create the image's striking views of the La Palma landscape and the shining star. The project promotes interest in and conservation of the night sky, and its work can be found online at www.project-nightflight.net. Canopus is likely 313 light-years away from Earth, and because of the object's brightness, it is useful in spacecraft navigations. The star is visible from February into the spring for latitudes up to 35 degrees north, project nightflight told Space.com in an email. In this photo, the "Dune" star hangs over a setting not so dissimilar from the Spice-mining planet author Frank Herbert imagined orbiting the star. But in the books, enormous, deadly sandworms terrorized that planet. "Although the often-barren, sandy dunes of the volcanoes on the Canary Islands sometimes remind us of [the series' first main character] Muad'Dib's Dune planet, there were absolutely no wormsigns near or far," project nightflight said.